Traycee has a “person-centered approach” to all senior home care situations, which focuses on engaging clients and encouraging and exposing them to life enrichment activities. Forming a partnership with clients and their families allows Traycee to support this philosophy of service. Specific services, whether hourly, weekend, or live- in include the following. Remember to look at Traycee’s specialty programs which are “no cost” enhancements to its “person-centered approach”. Traycee caregivers become the client’s friend/companion on many levels. This is accomplished through daily interaction which might mean lending a helping hand, just listening, reminiscing or having lively conversations. This relationship fosters trust, dedication and loyalty. Caregivers recognize the importance of giving medications on a timely, prescribed schedule and are careful to follow all medical orders. Caregivers assist with exercises and/or physical therapy as directed by a physician or physical therapist. Similarly,our senior care caregivers are trained to assist with walkers, wheelchairs, braces and crutches. Recognizing the importance of proper diet and perhaps, more importantly, honoring client preferences, caregivers like to work closely with clients and families to carefully plan all meals. To increase client independence, they are encouraged to use their own recipes and shop for groceries. Caregivers are respectful, professional and sensitive to a client’s need for privacy as they assist in these basic activities of daily living. When possible, Traycee in-home caregivers look to involve the client in many daily functions of the home. For example; folding towels while sitting at a table offers therapeutic movement and exercise for arthritic fingers and hands. Cleaning and laundry supplies must be provided by the client. This might include escorting the client to appointments, clubs, activities, or performing shopping and various errands. Whether the caregiver uses their car (a small mileage charge is assessed) or the client ‘s, getting out of the house and doing something different serves as an activity to engage the client and they are encouraged to participate whenever possible. Life enriching activities are important to every human being. 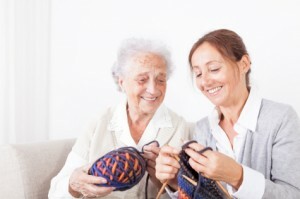 Traycee caregivers help clients engage in their favorite hobbies and activities to “make a good day”. These are built into each client’s “Plan of Service”. Relief is synonymous with respite. It can be very stressful caring for someone, even a loved one, 24/7. Traycee can provide that respite you need to recharge, revitalize, refresh and relax. A four hour minimum time period is recommended based on studies that have shown it is hard to relax and let go in less. When you feel your best, you can return and give your best.